Quite often we need to derive the values into a variable(target) from more than single source. SOA 11g Transform activity provides us a way to tag multiple sources in the wizard itself as shown below. The first source(source1Var) is passed as the normal source to XSL where as the second one is sent as a parameter to the same with the name source2Var and the value of the same is $source2Var. So now you can use this second source ( anything other than primary source) as a parameter inside the xslt mapping. Now lets see how we can work on multiple sources in XSLT. Lets say you have requirement like this. 1. 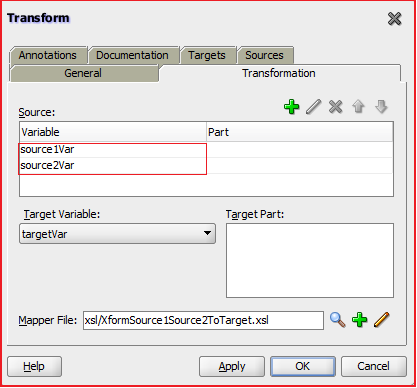 Some of Target variables data elements depend on source1var. 2. Some of them depend on source2Var. Loop through the source2 for each record of source1 , then find that record whose "id"(of source2) matches with "id" of source1.Now then multiply source1Var/x element with the fetched record of source2Var/y. 1,2 are pretty straightforward with the mapping done directly. Coming to scenario 3 we may need to tweak xslt a little bit like below by using some local variables. If you observe we are using an inline xpath matching of the value id of source2(id) with id of source1($id). This acts like another loop(on source2's complex element) for us ( avoiding a real loop to be written). So thats it ! It works. Please find below is the solution for the same using the above mentioned approach. Populate "c1Crr" field of target based on below logic. I am wondering whether it is possible to pass parameters into a transform in a routing rule in Mediator in Soa SUite 11g, or can it only be done within Bpel? Hello Sridhar, I have a similar requirement in my xslt. I have been able to add multiple sources to the xslt. While I'm building the my SOA Composite, am getting the below exception. Error(199): Namespace prefix "" qualifying "inputVariable.payload" cannot be resolved. 2) The compiler is able to identify the first source properly but it is not recognizing the second , third etc properly and it complains in all the places about namespace not resolved. Note : Our build server uses the SOA 11.1.1.7.0 libraries to build the composites. But the project compiles properly on the 11.1.1.6.0 jdeveloper properly. Can you please shade some light on this?